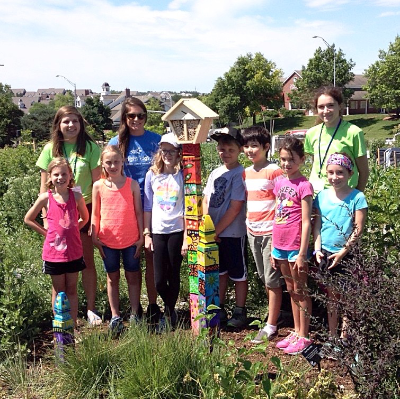 You know that Bright Lights provides supervised, engaging, hands-on learning activities through week-long half-day classes and full-day camps for five weeks in the summer. What you may not know is that Bright Lights offers additional care options to help busy parents who need full-day care. 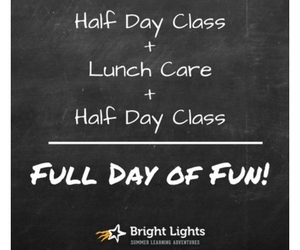 The formula is simple: a Half-Day Morning Class + Lunch Care + Half-Day Afternoon Class = Whole Day of Fun! In addition, Before Care is available beginning at 7:30 AM, so you can rest easy knowing your summer adventurer is busy, challenged and surrounded by caring teachers and volunteers. Registration opens April 1, and as you register for classes you can add Before Care/Lunch Care options for one payment. Visit http://www.brightlights.org/programs/ for additional information to help plan your child’s Formula for Fun!